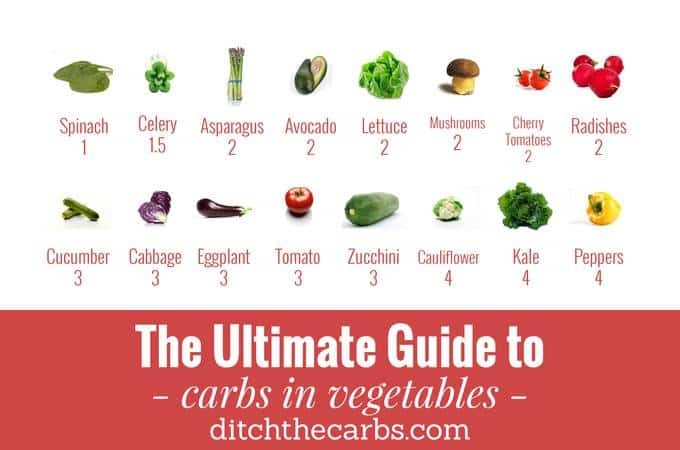 If you’re going low carb, The Ultimate Guide To Carbs In Vegetables will guide you in choosing which vegetables are best to incorporate in your diet. Each value is the net carbs per 100g using cronomter.com Net carbs is the total carb value, minus the fibre. Vegetables are definitely the healthier (and better choice) when preparing meals. However, it must be noted that the different types of vegetables have different nutritional values. Take a look at the graphic below to see the carbs in vegetables, using the easy photo grid … or print it out and keep it on your fridge. When you decided to begin the low-carb lifestyle, the first thing that probably came to your mind is that you’re going to eat a lot of vegetables to bulk up your meals. You might even have thought that you can eat as much as you want! That’s not really the case with the low-carb lifestyle. Although vegetables are healthier and much better options for bulking up meals rather than bread, pasta or rice, you also need to be aware of the carbs in vegetables. Some vegetables such as starchy root vegetables should be avoided in large quantities. What About High Carbs In Vegetables? Personally, no vegetables are off limits, but I am aware of the carbs in vegetables and account for them in my daily allowance. I also allow my children to eat whatever vegetables they like, but starchy root vegetables do make much less of an appearance for them than they used to. My family prefer to bulk up our meals with lower carb vegetables. If however strict blood sugar control is required, or you still have weight to lose, then knowing the carbs in vegetables is a must. 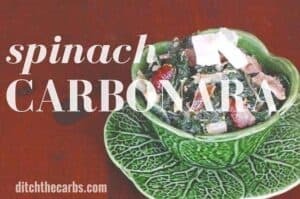 There are ways you can still enjoy some higher carb vegetables (see below for recipes) with some tricks to make them lower carb. For example, enjoy an occasional parsnip, but use a vegetable peeler to create thin ribbons then fry them gently in coconut oil. The coconut oil will make you fuller faster and for longer, and one parsnip will go a long way. If you really want to enjoy a higher carb vegetable, especially with friends and family so you don’t feel left out or to please your host, just have a small piece, truly enjoy and savour it, and don’t go back for seconds. Vegetables are packed with fibre, micronutrients and phytonutrients. They provide us with vitamins and minerals that processed and fortified food just cannot come close to. One argument when we give up whole grains, is that we will become deficient in nutrients and fibre. My counter argument, is that any loss of fibre of fortified nutrients is more than made up with our increased intake for vegetables. Additionally, we eat our vegetables with healthy fats which helps make them more palatable (especially for children) and enhances the absorption of the fat soluble vitamins A, D, E and K.
When you eat low carb, sandwiches and pasta dishes are long gone, but the volume of vegetables increases. Many vegetarians I know who have made the swap to LCHF have commented that their vegetables intake has sky rocketed once they stopped basing their meals on pasta, rice and whole grains. Knowing the carbs in vegetables, just allows you to make an informed choice. Eating real, unprocessed food is the back bone of LCHF. Click on any of the pictures to take you straight to each recipe. I have given vegetarian options for those recipes that contain meat. Spinach carbonara can be made with spinach, silver beet or any leafy green vegetable. 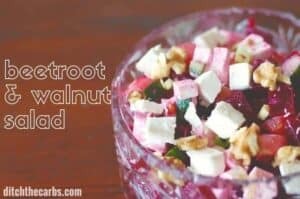 It is flavoured with bacon, garlic and cream cheese to make for an incredibly tasty and satisfying side dish or even a main meal . To make it vegetarian, simply omit the bacon. For me, this is the ultimate LCHF meal. Chicken Caesar salad. It is low carb. 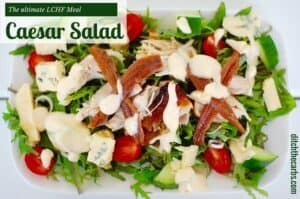 moderate protein and high healthy fat from the homemade mayonnaise. To make it vegetarian, simply omit the chicken and anchovies. Replace with smoked salmon (if pescatarian) or various cheeses. 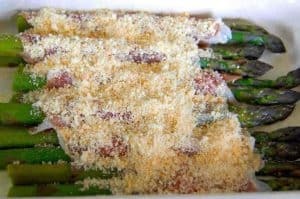 Asparagus wrapped in prosciutto, then covered in parmesan are amazing. They can be cooked in the oven or on the bbq. It can be served as a side dish, appetiser or a small main meal. To make this vegetarian, simply omit the prosciutto and cover in any cheese you prefer. There are so many recipes to use avocado, simply on it’s own, stuffed with tuna mayonnaise or as my favourite, guacamole. 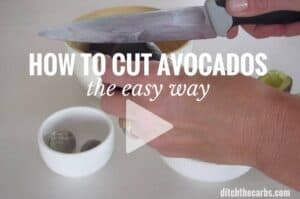 But before you start any of them, watch my video “how to cut avocados the easy way”. I never knew I cut them completely different to anyone I know. 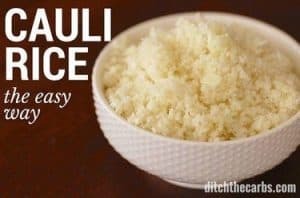 An absolute staple in low-carb cooking, is cauliflower rice. Don’t let anyone tell you it’s bland, they just haven’t found the right recipe yet. I like to flavour mine intensely. For a curry, I will cook it in coconut cream and add some spices, for stir fries, I might add some herbs or stir fry liquid that comes out as vegetables cook. 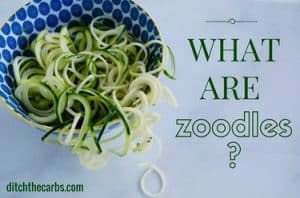 Have you made zoodles yet? They are the perfect replacement for pasta. Packed with nutrition and fibre make these ribbons so delightful in low-carb spaghetti bolognese. 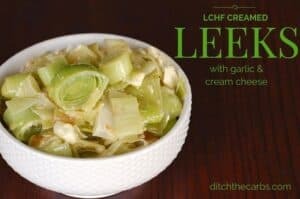 Another low-carb must try recipe. 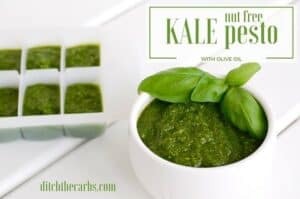 Kale pesto is a super way to use abundant basil and kale from the garden. Versatile as a dip or stirred through zoodles. 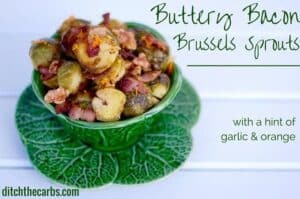 Who doesn’t love the sound of buttery bacon Brussels sprouts? There is a hint of orange and walnut in there (both are optional) but this has changed many Brussels sprouts hater, into a Brussels sprouts convert. To make this vegetarian, omit the bacon and add garlic instead. 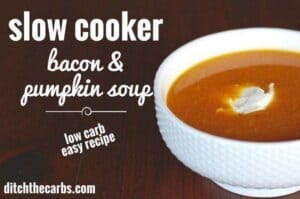 Slow cooker bacon and pumpkin soup is a great winter warmer. Just throw it all in the slow cooker, and dinner is ready when you come home. The coconut cream makes this soup especially filling. To make a vegetarian version, don’t add bacon but use extra vegetables stock, garlic and nutmeg to flavour. Although beetroot is a root vegetable and considered too high for many, I like to use it to bring amazing colours to my salads. Add plenty of cheese and walnuts and this could easily be a min meal. Leeks are high in carbs, but of you serve them as a small side dish, covered in cream and garlic, then you won’t be able to overindulge. This is my absolute favourite way to enjoy leeks. HOW MUCH IS 100G?, IS IT 1/2 CUP OR 1 CUP OR WHAT?. What are the serving size on vegtables? These values are all per 100g. I didn’t put serving sizes as it will differ per person and depending on which main dish you decide to serve them with, may require more or less. Thank you for such comprehensive and helpful info on carbs! I am new to the low carb lifestyle and it is overwhelming at times. These quick references are making it so much easier for me to make the right food choices. Brilliant! I’m glad they are helping you choose wisely. Really, really like everything you post. For someone new to Keto, so helpful.How do I get your info in my email? Want to save everything you post. It is truly helpful information. Most relevant info on a low carb diet. And well explained. I feel that one key element to rock the low-carb/keto diet is to know your veggies. This truly can make or break your diet. I like that you tied together veggies with recipes. I’d love to see radish, turnip, rutabaga, acorn & butternut squash, spaghetti & pattypan squash and olives, both green & black, jícama, snow peas, green pepper (theyre less carbs than a ripe pepper) all on your chart. That would be superb! Thanx for all your work, Libby! Yes g stands for grams. That is about 3.5 T in WEIGHT equality but NOT volume equality. So you would need a scale to weight any foods you wished to use based on the info in this chart. The logic of using this standard weight is great — that way you can assess the relative high carb and low carb veggies on the basis of a low carb veggie of 2 net grams carb would be a LOT healthier to eat than the same amount of a veggie with 13 net carbs per 100 grams weight.